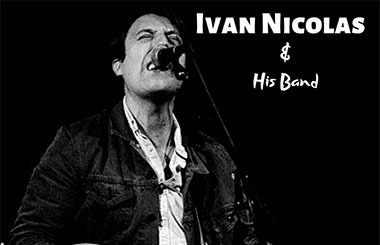 Ivan Nicolas & His Band play upstairs in Whelan’s on the 23rd of March 2019. Support TBA. Irish Singer-songwriter Ivan Nicolas started out as a drummer in a blues band and then progressed to guitar and piano. He luckily crossed the path of Philip Donnelly, Philip was a session musician for Johnny Cash and was a frequent luminary of The Everly Brothers, John Prine, Emmylou Harris, Nanci Griffith, Townes Van Zandt, Donovan, and many others on the Nashville circuit. During Ivan’s time touring with Philip and being mentored by him he began to learn the craft of song writing and performing. After honing his craft, Ivan decided to move to Kerry to live on the side of a mountain for a year in solitude working on writing his debut album. Living with such open space around him helped sculpt his personal process of loss and love on many levels. Weaving songs into a great tapestry drawing from personal experiences such as the loss of a friend and intimate trials and tribulations of human relationships. His debut album was partly recorded in Grouse Lodge studios and finished in Valencia, Spain with acclaimed producer Dani Castelar (Paolo Nutini, REM, Liam Clancy). Ivan released his first single ‘For The Weekend’ in April 2017, to much acclaim from 2fm to Radio Kerry and the highly sought after BBC Introducing. Ivan’s set at HWCH 2017 got a great reaction and some industry recognition. His latest single ‘Moving On’ is getting national radio play across Ireland. “Dublin singer-songwriter Ivan Nicolas and his new single ‘Moving On’, which swings from old school 80’s pop rock to modern indie stylings you might expect from The War on Drugs and gets better and better with every listen.” Remy. Pixie Cut Rhythm Orchestra is an alternative indie rock band from Dublin. Following their first headline show at the Workman’s Club in 2017, they have supported other upcoming Irish acts such as Munky and Just Mustard. PCRO’s influence is broad and eclectic, fusing a range of styles to create a unique sound. The outfit consists of Sarah Deegan – lead vocals & rhythm guitar, Sorcha Jordan – lead guitar & backing vocals, Alice Grollero – bass, Danni Nolan – drums and Ciaran Jack Hoyne – keyboard. “A rich meld of folk, indie and alternative-rock, with a small hint of punkish D.I.Y bustle, Pixie Cut Rhythm Orchestra’s music is hard to completely define. PCRO’s debut single ‘Metamorphosis’ is due for release in April 2019. Pixie Cut Rhythm Orchestra will also be appearing on Anon Records’ compilation EP ‘Sycophancy’, which is due for release in June 2019.